As it prepares to go public, Pinterest has its sights set on global growth. In 2018, the image search and sharing platform surpassed 250 million monthly users—but its US growth has stagnated. The company counts 8 out 10 moms and more than half of all millennials among their total US audience, leaving limited room for further growth in those desirable demographics. 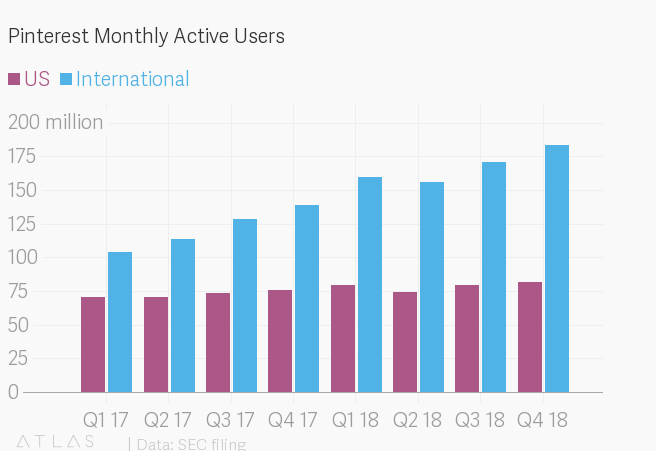 Meanwhile, its monthly active users have grown dramatically internationally. In 2018, more than 80% of new signups were from outside the US. The one problem? 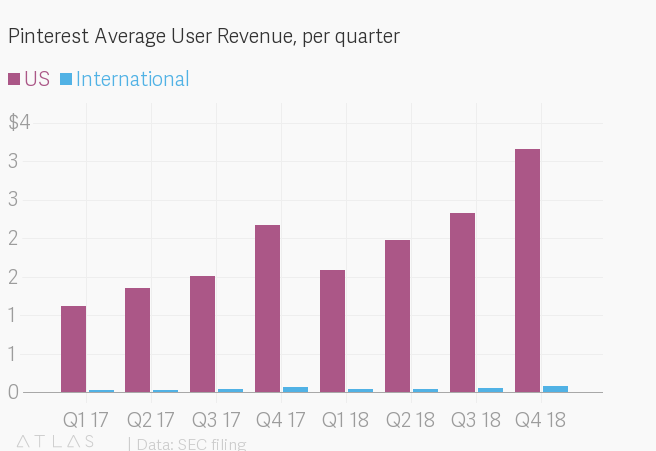 International Pinners generate a fraction of the revenue of those in the US—about $.25 per user in 2018 versus $9.04 for American Pinners, according to the S-1 the company filed on March 22 in preparation for an initial public offering sometime in April. Some of this disparity may come down to just not having the ad infrastructure in place to turn Pins into dollars—or euros, yen, or reals. The company rolled out Pinterest Ads in Spain, Italy, Germany and Austria in March. The service, which allows businesses to promote specific Pins to targeted Pinners, already exists in the US, UK, Canada, France, Ireland, Australia, and New Zealand, and has launched trials with selected companies in Netherlands, Belgium, Portugal, and Switzerland. Based on international growth, Pinners around the world are just as eager as Americans to plan a vacation, get crafty, or look at new recipes on Pinterest. The real question is how similar their spending habits will be.